When you get married you're expected to arrange a massive event, but with no real experience of what's needed! We get asked lots of similar questions, so we've put these into a FAQ section both this and next month to help you with your wedding planning. But remember no question is silly! If you have a question you want to know the answer to, just hit reply to this email and ask us - we're all human here and will reply to you! The standard wrapping we do for hand tied bouquets is an ivory satin ribbon finished off with pearl pins. This ribbon covers the area where your hand will be holding the bouquet and a small amount either side, with stems showing at the bottom. 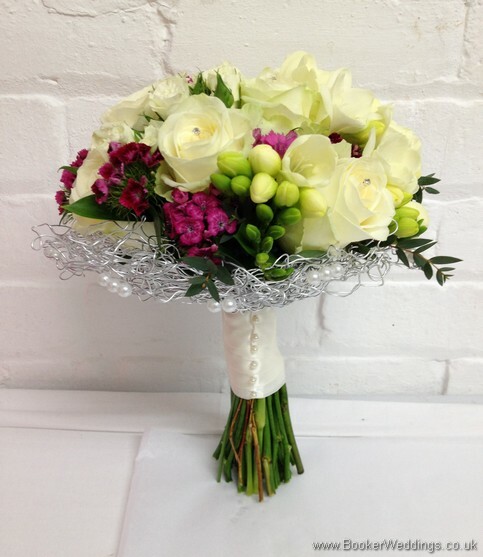 You can customise this, for example change the colour to match or compliment your wedding colours. You could also have the stems wrapped over completely or you could have bows or trailing ribbons hanging down. We're here to produce your vision so we'll happily customise to your specifications. Who carries or wears flowers in the bridal party? Bride and bridesmaid usually carry bouquets. The Groom, Groomsmen, Ushers, Best Man and Fathers of the Bride and Groom have buttonholes. The Mothers of Bride and Groom have a pin corsage, however sometimes they opt for a wrist corsage. 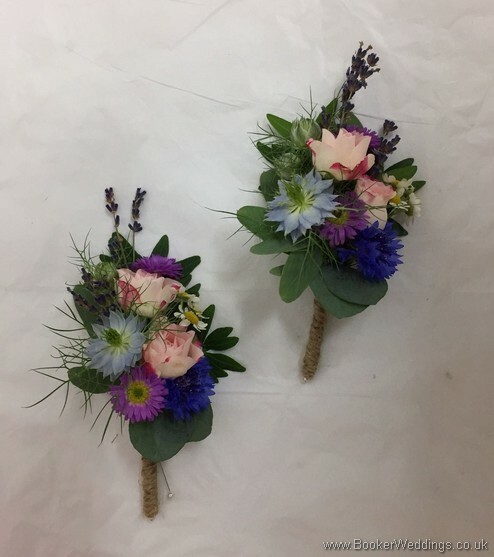 Sometimes the buttonholes are extended to everyone at the wedding, however it's more usual these days for it just to be the immediate wedding party and maybe a few other key family members such and Nans and Grandads who have them. 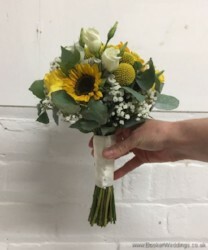 We condition our wedding flowers really well and make sure they have all the special food and treatments to ensure that they will look tip top throughout the day. It's worth noting though that once you receive your flowers they're not drinking so it's advisable to keep them out of draughts, direct sunlight or heat sources until they're being used. At the end of the day if you're keeping your bouquet, cut the stems before putting them in water. By then the ends will have sealed so they won't be able to drink without a fresh cut.